Davey D, nationally recognized journalist, adjunct professor, Hip Hop historian, syndicated talk show host, radio programmer, producer, deejay, media and community activist, interviews Sunsara Taylor, and three more of the Abortion Rights Freedom Riders. Rose Aguilar gives the gist of the Abortion Rights Freedom Ride, and then asks the question, "What is the most effective message for abortion rights protestors?" David Gunn, Jr., Liza Fuentes, Charlotte Taft, and Deb Hauser discuss and callers weigh in. 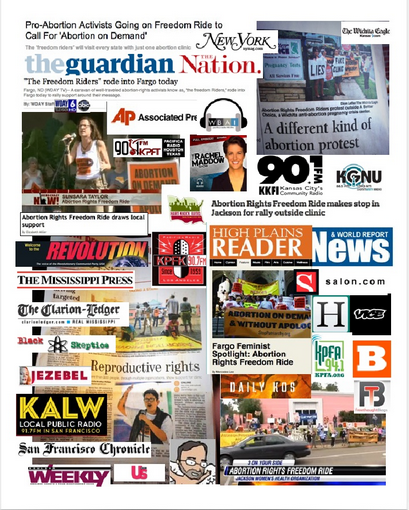 Michael Slate interviews Sunsara Taylor, from the road, on the Abortion Rights Freedom Ride. Jerry DeWitt from Atheists Talk Radio interviews Sunsara Taylor the day before the Abortion Rights Freedom Ride stops in Minneapolis.